As promised I will be holding a little private tournament for the viewers here. The tourney will be open for 64 teams, and will be put in brackets. 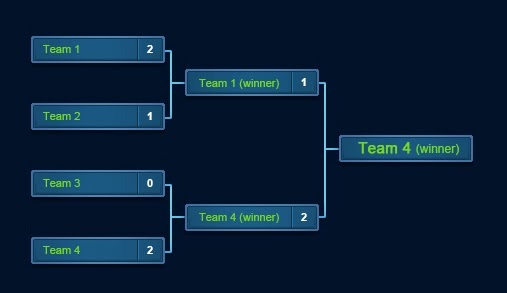 This will be double elimination, and therefor you will end in a loser bracket when you lose your first match. This is how the brackets will look like. However this is only a 4 team tournament. This is a 2v2 tournament, and therefore you will need to be 2 players on your team to participate in this Fifa tournament. Later there will be a 1v1 tournament. Once these have been sent, I´ll take the first 64 teams who signed up and send a email regarding when the tournament will be hold. This will run over 2 days in 2 weekends. So everyone can join! For any questions, please email me at tourney@fifafreaks.com with email subject: Fifa 15 tournament question.